We are Pieter and Saskia, owners of Casa Los Eucaliptos, an old finca in the Andalucian countryside. At about 30 minutes from the Mediterranean Sea Casa los Eucaliptos offers plenty of quiet and space. The house is secluded in the fold of a mountain. The winters are soft, and in the summer we have cool winds passing through. The finca has its own private road with barely any traffic providing ultimate privacy. The garden has several terraces, the big terrace with shared pool also has the outdoor kitchen and barbeque for the B&B guests, and smaller sun and shadow rich terraces ensuring everybody has privacy. The orchard is a play paradice for children; building huts out of bamboo, playing on the swing or the slide of the playhouse, or enjoying a game of field hockey on the artificial grass field is all possible here. During the season oranges, lemons and grapes can be harvested! Free Wifi available on the entire ground. 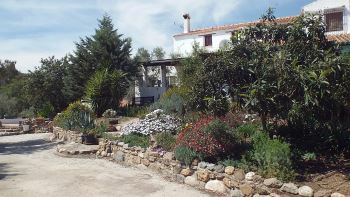 Casa los Eucaliptos is situated in the vast borough of the town Comares, a White, Mountain town with Arabic characteristics, and at 10 minutes from the paintlike white town of Riogordo. In Riogordo you can find all you need like stores, restaurants and public transport. From the airport in Málaga the house can be reached in 50 minutes. The cities of Granada, Cordoba en Málaga are close enough for a day long visit, Seville is a little over a 2 hour drive. Andalusia is big, about twice the size of the Netherlands, but the highway´s are in perfect condition and traffic isn´t busy. Places such as Ronda, Antequera (Natural Park El Torcal), Marbella and Nerja are all about an hour away, the pleasant beaches of Torre del Mar can be reached in about half an hour. Life here is simple, people live of what the land gives them and often don´t speak anything else then Spanish but are very welcoming and willing to help when necessary.